On Wednesday March 1st 1961 the amalgamation of the The Buffs and The Queen’s Own Royal West Kent Regiment was consummated with a ceremonial parade at Ross Barracks. Two guards representing The Buffs with their Colours and two guards representing the Queen’s Own with their Colours marched on parade. The regimental flags of The Buffs and the Queen’s Own were flying from separate poles. As they were lowered to Auld Lang Syne the parade presented arms, a trumpet fanfare was sounded and the flag of the new regiment, The Queen’s Own Buffs, with its white horse on a background of buff and blue, was broken from the top of a third, central flagpole. The new Regiment had been born. With hardly a dry eye and with a lump in many a throat, the old colours of the two outstanding regiments were marched off for the very last time and on October 5th 1963 the colours of both regiments were handed over for safe-keeping in Canterbury Cathedral. The battalion served in Kenya for six months returning to Shorncliffe in January 1962 when Lt. Colonel Dendy handed over the battalion to Lt. Colonel H. B. H. Waring. On June 23rd 1962 the Colonel-in-Chief, King Frederick of Denmark, presented new colours to the battalion. 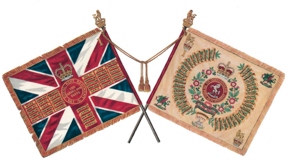 The Colours of the new battalion The Queen’s Own Buffs, The Royal Kent Regiment.